Smartphone technology has been increasingly used in the medical field and is currently rising in the field of behavioral health. Some behavioral health interventions include addressing substance abuse (Bernhardt et al., 2009; Freedman, Lester, McNamara, Milby, & Schumacher, 2006), traumatic brain injury (DePompei et al., 2008), and severe mental illness (Depp et al., 2010). Depending on the application, smartphone technology can allow for patients to track and monitor their symptoms, allow clinicians to be able to monitor their client’s behavior and symptoms remotely, lower cost for clients, and provide 24-hour service (The National Institute of Mental Health, “Technology”). Smartphone applications have also been used to detect significant distress in patients. For example, the eMood Bipolar Mood Tracker app (Gigaram Technologies, 2011), allows patients to track their mood daily, medication adherence, and anxiety levels which the patient’s clinician can easily obtain and review (Luxton, McCann, Bush, Mishkind, & Reger, 2011). FOCUS, a smartphone intervention for patients with schizophrenia, provides symptom management support to reduce symptoms of schizophrenia (Ben-Zeev, Brenner, Begale, Duffecy, Mohr, & Mueser, 2014). Specifically, the reduction in symptoms of schizophrenia, particularly depression, was associated with reduction in frequency of utilization of the mobile intervention. That is, the fewer symptoms of depression a patient endorsed, the less they used FOCUS. Additionally, symptoms of schizophrenia were assessed before and after the implementation of mobile intervention. Results illustrated a decrease in positive symptoms associated with schizophrenia and general psychopathology (Ben-Zeev, Brenner, Begale, Duffecy, Mohr, & Mueser, 2014). While these findings are preliminary they suggest technological behavioral health interventions can be useful in treating mental health disorders. Smartphone technology allows for interactive communication as well. With the use of mobile interventions, frequent communication between clients and therapists is a much more feasible possibility. Additionally, therapists and clinicians are able to give immediate feedback to their clients with mobile interventions. This is illustrated in a research study conducted by Kristjánsdóttir et al. (2013), focusing on women with chronic pain. Women in the study were assigned to either the smartphone intervention or control group. Participants assigned to the smartphone intervention received one face-to-face session, in addition to four weeks of journaling via smartphone. The journal entries were made immediately available to therapists, thus allowing for them to provide immediate feed-back. Results illustrated those participants who received immediate feedback, catastrophized less, and were more likely to accept their pain. This study suggests the efficacy of smartphone technology in the field of mental health may aid in effective treatment of various psychiatric and psychological conditions. Complementing in-person therapy (via homework completion on smartphone, extending an in-person session, etc.). Each of these functions provides unique advantages, but due to limited empirical research, how these functions might enhance current mental health practices remains uncertain. Collectively, such smartphone technologies for mental health-related issues could potentially provide greater access, anonymity, convenience, and consistency all at a relatively low cost. Smart-phone technologies using these apps could increase scalable options of mental health care and greatly enhance dissemination of helpful resources and evidence-based treatments for psychiatric disorders. Persons using smartphone technologies to supplement in-person therapy may also become more compliant with home-work and have improved session attendance. These technologies also have the potential to create more connections between persons struggling with mental illness and sources of support. The National Institute of Mental Health (NIMH) has affirmed all the potential benefits of smart-phone technologies, but has also identified areas of concern. Many of these are due to the current paucity of research into the efficacy and effectiveness of most existing smartphone technologies (Donker et al., 2013; Bakker, Kazantzis, Rickwood, & Rickard, 2016). Some of the questions that remain to be answered include: Does a given technology improve the symptoms or concerns it claims to? Do the benefits conferred by a certain technology work equally well for different groups of people? And, are there ethical issues that need to be considered when using these technologies? The body of literature on the efficacy of various smartphone technologies is minimal and there are also few regulations or standards of practice to guide clinicians in the use of behavioral intervention technologies. A lack of regulations and standards may make it difficult for consumers to determine which technologies can be trusted as efficacious. While many of these technologies have the added benefit of anonymity, it is often not clear how truly confidential and private a consumer’s protected health information is for certain technologies. Furthermore, as any of the above concerns potentially negatively affect consumers of these technologies, there is concern that such consumers may then become discouraged from seeking other more validated forms of mental health support and treatment (The National Institute of Mental Health, 2016). Major Depressive Disorder (MDD) is one of the most common mental disorders in the US affecting 6.7% of all US adults reporting at least one Major Depressive Episode in 2015 (NIMH.gov). The majority of individuals diagnosed with MDD would prefer a non-pharmacological intervention, but 75% of those individuals report many barriers to such treatment (Mohr, 2012). In order to address such barriers, Mobilyze was developed to provide skills based education and intervention for those with depression. Mobilyze is an Android only program focusing on skills building for depression. This results in more parts of the app dedicated to such actions. For example, the mood check-in is a quick slider but there are two parts of the app that focus on building skills. It begins with examining the aspects that cause individuals to use internal coping (e.g., escapism, procrastination). As these can be positive or negative, the individual is then asked to review the consequences and what they would change. There is also the option to make “coping cards” for techniques that have worked for the individual so that they can practice them in the future. More specifically, they can schedule a card to pop-up when they know there is a particular stressor they will encounter on a specific day. As opposed to a strict mood calendar system, Mobilyze provides “lessons” that reinforce tenets of CBT for depression (e.g., ‘Feelings are not facts’ and ‘You are what you repeat’). A clinical trial examining the effectiveness of the app in conjunction with telephone coaching found the intervention to be beneficial leaving the subjects less likely to meet criteria for depression based on self-report measures and clinical interviews (Burns et al. 2011). After the 8-week intervention, they were also less likely to meet criteria for an MDD diagnosis (ibid). A key finding is that participants were able to better assess triggers and situations that can affect their mood which was measured through coping card planning and location information (ibid). Post Traumatic Stress Disorder (PTSD) affects both children and adults, however symptoms can present differently in child/adolescent populations. Thus, Trauma-Focused Cognitive Behavioral Therapy (TF-CBT) was created to address PTSD in this population. TF-CBT was developed by Judith Cohen, MD and Anthony Mannarino, PhD, of the Center of Traumatic Stress in Children and Adolescents at the Allegheny Health Network, and Esther Deblinger, PhD, of the New Jersey CARES Institute. An application, called Triangle of Life, has been developed to supplement this leading evidence-based psychotherapeutic treatment. The Allegheny Health Network mental health professionals and students at the Entertainment Technology Center at Carnegie Mellon University created Triangle of Life. The application is designed to help children ages 8-12 to better understand their thoughts, feelings and behaviors, and move toward a better quality of life (Waite, 2015). The application utilizes a game-like strategy in which the player assumes the role of the lion in an African jungle themed story. They then guide other animals to- wards positive experiences and relationships (Waite, 2015). Dr. Judith Cohen stated, “The Triangle of Life app gives us a new and engaging way to teach traumatized children healthy cognitive coping skills. Today kids are savvy users of tablets and smartphones, and an app provides a new tool for therapists to implement TF-CBT in a fun way,” (Waite, 2015). This application allows for children to practice their cognitive coping and relationship skills between therapy sessions, which will help them strengthen new ways of thinking. One study utilized playtests to determine the feasibility and likeability with children, in which they rated the game highly across a series of the playtests (Assigana, Chang, Cho, Kotecha… 2014). Numerous clinicians have used Triangle of Life and have provided the creators with positive feedback (Waite, 2015). Triangle of Life earned an Honorable Mention in the United Nations Alliance of Civilization’s 2014 PEACE application awards, which recognize digital games and gamified apps as venues for cultural dialogue and conflict management (Waite, 2015). The application is available for free on both Google Play and Apple iTunes. Another disorder that requires children to utilize the tools and practice the skills learned in therapy, outside of the therapy session is Attention Deficit/Hyperactivity Disorder (ADHD). A large component of treating children with ADHD is to help them regulate and manage their behavior inside of the classroom. Mobile applications provide promising platforms to aid in managing behavior inside of the classroom. One application, iSelfControl was designed to support classroom behavior management (Schuck et al., 2016). This application prompts students every 30 minutes to self-evaluate using a universal token-economy classroom management system. Simultaneously, the teacher evaluates each student on a separate iPad. Students are able to see if self-ratings agree with the teacher-reported scores, and can monitor their progress throughout the day on charts displayed on the iPad (Schuck et al., 2016). Students can earn points for demonstrating behaviors such as following directions, following rules, staying on task, and getting along with others. However, any maladaptive behaviors reduce the amount of points a student earns during each 30-minute period (Schuck et al., 2016). In a pilot study, 5th grade, male children with ADHD participated along with their classroom teacher. Over the 6-week study period, iSelfControl was utilized consistently and received well by 70% of the students and their teacher (Schuck et al., 2016). The application provided an opportunity for self-reflection in the classroom, which complemented the cognitive behavioral therapy the students received (Schuck et al., 2016). The findings from the pilot study indicate that the use of iSelfControl may support the progress of self-control and self-awareness in children (Schuck et al., 2016). It is important to note that this application is currently still being modified before offered in the application market. Assigana, E., Chang, E., Cho, S., Kotecha, V., Liu, B., Turner, H., Zhang, Y., Christel, M., & Stevens, S. M. (2014). TF-CBT triangle of life: a game to help with cognitive behavioral therapy. In Proceedings of the first ACM SIGCHI annual symposium on Computer-human interaction in play, 9-16. ACM. Bakker, D., Kazantzis, N., Rickwood, D., & Rickard, N. (2016). 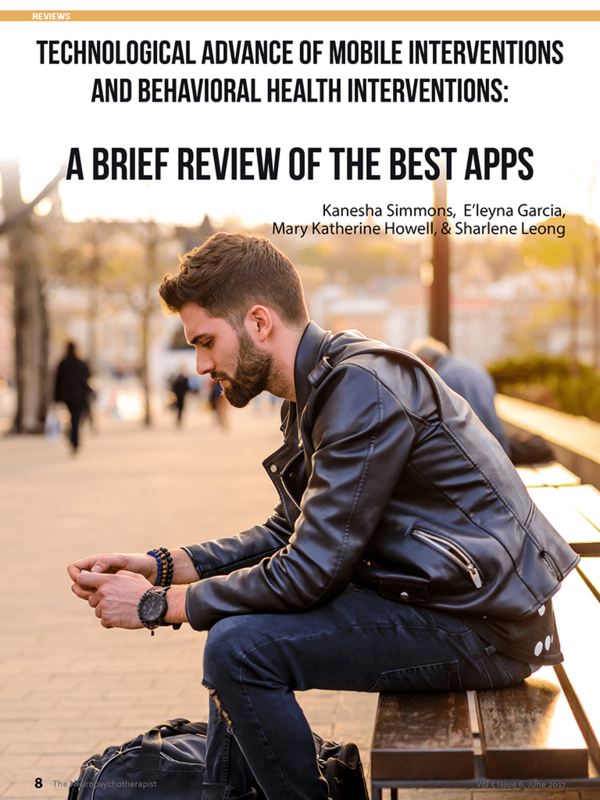 Mental Health Smart- phone Apps: Review and Evidence-Based Recommendations for Future Developments. JMIR Mental Health, 3(1). Bernhardt, J. M., Usdan, S., Mays, D., Martin, R., Cremeens, J., & Arriola, K. J. (2009). Alcohol assessment among college students using wireless mobile technology. Journal of studies on alcohol and drugs, 70(5), 771-775. Burns, M. N., Begale, M., Duffecy, J., Gergle, D., Karr, C. J., Giangrande, E., & Mohr, D. C. (2011). Harnessing context sensing to develop a mobile intervention for depression. Journal of medical Internet research, 13, e55. DePompei, R., Gillette, Y., Goetz, E., Xenopoulos-Oddsson, A., Bryen, D., & Dowds, M. (2008). Practical applications for use of PDAs and smartphones with children and adolescents who have traumatic brain injury. NeuroRehabilitation, 23, 487-499. Depp, C. A., Mausbach, B., Granholm, E., Cardenas, V., Ben-Zeev, D., Patterson, T. L., Lebowitz, B. D., & Jeste, D. V. (2010). Mobile interventions for severe mental illness: design and preliminary data from three approaches. The Journal of nervous and mental disease, 198, 715. Donker, T., Petrie, K., Proudfoot, J., Clarke, J., Birch, M. R., & Christensen, H. (2013). Smartphones for smarter delivery of mental health programs: a systematic review. Journal of Medical Internet Research, 15(11), e247. Freedman, M., Lester, K., McNamara, C., Milby, J., & Schumacher, J. (2006). Cell phones for ecological momentary assessment with cocaine-addicted homeless patients in treatment. Journal of Substance Abuse Treatment, 30, 105–111. Grünerbl, A., Muaremi, A., Osmani, V., Bahle, G., Oehler, S., Tröster, G., Mayora, O., Haring, C., & Lukowicz, P. (2015). Smartphone-based recognition of states and state changes in bipolar disorder patients. IEEE Journal of Biomedical and Health Informatics, 19, 140-148. Kessler, R. C., Akiskal, H. S., Ames, M., Birnbaum, H., Greenberg, P.,. A, R. M., . . . Wang, P. S. (2006). Prevalence and effects of mood disorders on work performance in a nationally representative sample of US workers. American journal of psychiatry, 163(9), 1561-1568. Kristjánsdóttir, Ó. B., Fors, E. A., Eide, E., Finset, A., Stensrud, T. L., van Dulmen, S., Wigers, S. H., & Eide, H. (2013). A smart-phone-based intervention with diaries and therapist-feedback to reduce catastrophizing and increase functioning in women with chronic widespread pain: randomized controlled trial. Journal of medical Internet research, 15(1), e5. Luxton, D. D., McCann, R. A., Bush, N. E., Mishkind, M. C., & Reger, G. M. (2011). mHealth for mental health: Integrating smartphone technology in behavioral healthcare. Professional Psychology: Research and Practice, 42(6), 505. McTavish, F. M., Chih, M. Y., Shah, D., & Gustafson, D. H. (2012). How patients recovering from alcoholism use a smart-phone intervention. Journal of dual diagnosis, 8(4), 294-304. Optimism Apps Pty Ltd. Optimism Apps. http://www. findingoptimism.com/. Accessed 26 Mar 2014. Rosser, B. A., & Eccleston, C. (2011). Smart-phone applications for pain management. Journal of telemedicine and telecare, 17(6), 308- 312.